Joe Swanberg is a Mumblecore alum who has only just recently embraced the genre that spawned his career. “It is a term I used to runaway from, and now I feel particularly lucky to have been affiliated with it. It’s just such an obnoxious word, I wish it was cooler, like French New Wave sounds really cool, Mumblecore does not sound cool.” Semantics aside, Swanberg explores new territory with his latest film Drinking Buddies, as well as some of the joys that come from a larger budget, recognizable actors, and other collabortive partners in the filmmaking process. I had the pleasure of speaking with Swanberg about his time making the film, his thoughts on the status of romcoms, and of course the best supporting actor a film could have, craft beer! I enjoyed that craft beer played a big role in this film. When did you first get involved with the craft brewing scene? My wife gave me a home brewing kit as a birthday present four or five years ago. I needed a hobby, I had been making films, and I had been making them at a really rapid pace. It was really all I was doing and thinking about. And, I needed something that didn’t involve finishing a creative project and then immediately having it judged by the world, either on a commercial scale or a critical scale. So brewing beer became a really nice escape for me where I felt creative, I could start and finish a project, and then I was done and could give it to my friends and it was just beer. So I really fell in love with it that way and then the more I was brewing, the more I was trying to drink other people’s beer to sort of see what other people were doing, and that was a way into the craft beer world in general. I saw a lot of corollaries between an independent brewery and an independent filmmaker. I think that we’re encountering a lot of the same obstacles in terms of what we make and how we get that thing into the world. I think the studio system is very similar to an Anheiser-Busch or Coors in terms of dominating the marketplace and then you have every independent film and every craft beer sort of competing for a little sliver of what’s left. But I’m really excited by the world, and I think that it’s happening right now in a cool way. I think craft beer is one of the more exciting things going on in America right now, and I am much more optimistic about craft beer than independent films. (laughs) But you know, independent films are just moving to the internet. They’re reaching a wider audience, they’re just doing it in a different way. So there’s a lot of beer in this film, and I promise this interview won’t be all about beer! I’m happy to talk about beer. Well it looks like there’s a lot of drinking going on (laughs), I don’t think I’ve seen that much beer in a movie. Was the beer all real? It was all real. We got to set the first day and we had some fake beer around and the actors all agreed right away that it was pretty gross and that they didn’t want to spend a month drinking it. I didn’t realize how much beer was in the movie until I cut it together. It didn’t feel like nearly as much while we were shooting spread out over 18 days. But when I finished the first cut, I was like, “Aw, man they are drinking a lot in this movie.” (laughs) But for me and the actors, it was sort of my chance to give them a guided tour through the midwest craft beer scene so it was an educational experience as much as a drinking experience. It’s nice to see such complex characters in Drinking Buddies. What was your process in making those characters complex? Usually, and especially with female characters, you don’t get that sort of complexity in typical romantic comedies. A lot of it is letting the actors do that themselves. I think that because most actors come to a project where the script is mostly in place, they have to build characters around the dialogue that already exists, or the vision that the writer already has in mind for the characters. I built a loose story structure, but in terms of the characters I had some real world models that I was basing them on, but really like I wanted all these actors to bring a ton of, not only their own sort of homework and research to it, but also their own personalities as well. And Olivia [Wilde] and Anna [Kendrick] are complex, well-rounded people in real life, so I think hopefully you are picking up on some of that, just some of their own personalities and then also my unwillingness to make a standard romcom. And I say that as somebody who loves romcoms. It’s a genre that I have always responded to. And they’re so bad right now. We’re living through the worst period for romcoms ever. They basically just stopped making them they’re so bad. So I’m just trying to make something that feels romantic, that feels complex enough to be romantic. I can’t feel romantic about people that don’t feel like real human beings to me. So that has to be the starting place. And then just mixing up the formula a little, and trying to make a movie that doesn’t follow the A-B-C plot line that these things always have, but something that gets complicated in the middle and stays complicated to the end. What will it take for romcoms to make a comeback? It’s tough to say. I think that certainly it would take money, it would take a couple successful ones in a row, that always works, that’s the easiest way. How they could make money is the trickier question. The audience has to demand it. I think this stuff is cyclical. Studios are very responsive to the way these things change, and they’ll milk something to the bitter end, but at some point they’re going to notice that people are interested in different kinds of movies. What I see happening right now is actually really encouraging because these giant tentpole movies are tanking, and these smaller movies are making tons of money. To me that says if the studios got back to the business of making $25 million movies rather than $250 million movies, they would make the same amount of money and they could take a lot more risk. That’s super encouraging, and I think that’s how romcoms come back. And you know actresses like Melissa McCarthy who just exploded in the last couple of years, the actors have to lead the way too, they have to choose those types of projects. It takes a year to get these things out but whatever the big actors are choosing to shoot right now, that’s what our culture is going to be the following year. If they decided that they wanted to focus on more personal stories and interesting challenging romcoms that’s what we would see. It takes a few of them to be brave. Drinking Buddies explores the complexity of different kinds of relationships. Can you discuss your vision for the film as it relates to real world experiences? Definitely, I was excited about trying to make a film about a couple that experience a problem in their relationship and overcome that problem. I feel that films need to sort of serve as a roadmap a little for people. We can’t expect that if all the media we consume is full of bad behavior and terrible decisionmaking that that won’t bleed over a little bit into the way that we live our own lives. I think that from the time I was a little kid, characters in movies were role models for me or antiheros or whatever, but I want to engage with an audience in a way that is useful or helpful maybe, seeing things up on screen that they’re dealing with in their own life. As somebody who has certainly met a lot of women along the way, women who excited me, who seemed like really exciting matches for me, and then seeing those relationships or friendships sort of fizzle and burn out as we realize that it’s not great to have exactly the same interests as somebody, and that it’s probably really healthy and normal to be with someone who’s going to challenge you and look at the role from a different perspective. I wanted to try and put these characters into the movie who were confronting that and dealing with that. I want the movies to sort of reflect societally how these things shift. Adolescence is being extended, we’re not forced to ask ourselves questions as early as we used to be. And that’s got to have an impact. At least in my own observations the older you get the more you get to know yourself and what you are looking for in a partner. And the harder it is finding someone that meets all those qualifications. When you are young and don’t know yourself very well, you’re malleable in a different kind of way. It’s going to be something that our generation is really going to have to confront. How do we really get into serious relationships in our mid thirties when we have a really good understanding of our wants and desires, how are we going to expect someone else in the same position to be flexible enough to both satisfy each other. That stuff is just interesting to me and so it was easy to jump into this movie from that point of view. You’re used to making lower budget films with amateur actors. Drinking Buddies has a bigger budget and more recognizable actors. Is this a direction you see yourself going into more in the future? In terms of the actors, there’s an added bonus that they are recognizable in the sense that they have already built a relationship with an audience, their own careers and fanbases sort of come to the movie, which is a little easier for a filmmaker. Beyond that, I think these people are famous for a reason because they are good at what they do. I suspect that at least for the time being I’m going to be more excited working with established actors, but I think I’ll go back and forth. I think it’s totally within my nature to want to tell different kinds of stories and there are certain stories that deserve to be told with non-professional actors and deserve to be told for not much money. The creative risks you can take on a $10,000 movie are very different than a multimillion dollar movie. And I’m still going to want to take those risks. I felt you had to choose one path or the other: You could make a smart interesting film that no one would see, or you could make an accessible movie that couldn’t be smart or interesting. There was a time when I didn’t want it to be entertaining, where I wanted it to be art with a capital A. Entertainment be damned. And I don’t feel that way anymore, I want to entertain people I think it’s a gift. When I think about my favorite movies they’re all really entertaining and they never forget to be that. So I’m trying to remind myself never to forget that. I’m not selling my soul to the devil if I try to entertain people. There’s a certain intimacy you get from a really tiny production that because I care so much about performance I’ve loved what we’ve been able to make with no money, when there’s just a couple of us in a room with a camera. But also on Drinking Buddies, it was a tremendous relief to not have to do all of the jobs myself. To showup everyday and have talented people filling in the roles that have always fallen on my shoulders. This film had a Video on Demand (VOD) release before a theatrical release. What are your thoughts on this, is it good for movies, bad for movies? I think it’s a good thing for movies, especially for independent movies. Accessibility is a big challenge, and VOD makes a film accesible to a lot of people. So that is certainly a good thing. I still like to go to see movies in a theater, that’s the way I prefer to watch things, but I also rent things VOD too. For me it’s not an either/or, because a lot of the classics of cinema I watched for the first time on my TV, and then the ones I really loved I went back and saw in the theater later, because there’s a whole repertoire programing scene, and these movies the ones that last, come back to the theater all the time. So you’re not necessarily missing the chance to see the movie the way you want to see it. I always think about myself as a high school student when I was first getting into and falling in love with movies, and I would read filmmaker magazine and I would try and stay up on independent filmmaking because that was the stuff I was always into, and if the movies came into Chicago, I would have to drive into the city or take the train with my friends to see them. And sometimes they would never come near me, so I knew about a lot of films, but I didn’t see a lot of films. These days if I was a high school student I could see all of them. They are all accessible. I think that’s amazing. It opens up the conversation to a whole wide range of people who are desperate to be a part of the conversation but don’t have access. I really enjoyed the final scene of this film. Was it always your intention to film the scene without dialogue? I didn’t know that the final shot was going to be the final shot, but when we were filming it, we all kind of knew that yeah, this is the final shot. I’m a big fan of silence, you reach a point where you’ve said enough and at first we did that scene with the two characters talking. And then on the third take I said, “Ok, no one say anything just do it and we’ll see what happens.” And we really liked it. It’s the cool thing about working in an improvised fashion. I’m sitting there, also being entertained by what is happening because I don’t know whats going to happen. So the process of making the movie is really fun for me because I’m getting to watch the movie too, I’m not sitting there going like, “Ok I wrote these words and your saying them wrong.” I get to be a spectator and when it works, I can feel that it works the same way, hopefully, that it works when it’s cut together in the final film. I can only imagine how difficult it is editing a highly improvised film. How do you choose what stays and what goes? I have to go through waves with it. So first time through the footage, I am like laughing at everything. I have to actually go through the process of seeing it enough where it’s not funny to me anymore, and then I can start making decisions. Because I need it to be functional too. And that starts to happen naturally. My first cut, which was probably half an hour longer than the movie ended up being, there’s a lot of stuff that I really loved, that I thought was funny, or charming, and you just have to work it out of your system. And you know what’s a big help? Showing it to people. Because their response isn’t going to lie to you. You also carry a lot of things from set into the editing room. You remember it being funny when it happened, but in fact it’s not that funny, or it was only funny when it happened that one time, or because of something that someone said earlier. When you sit five people down in a room and show them the rough cut of the movie, you know instantly if something was an inside joke and it’s not funny to anyone else. And that stuff’s got to come out. I’m a brutal editor after a couple passes of it. My nightmare is to sit in a theater with an audience whose just sitting there with their arms crossed thinking, “Oh you think this is funny? You guys all think you’re really funny.” With drama it’s a little harder, but comedy, you know, it’s crystal clear. So aside from being busy promoting the film, what have you seen in theaters this year that entertained you? The two movies that I’ve loved the most this year are nothing like the films I make. (laughs) Pain & Gain, I think that movie is awesome. And The Conjuring, which I saw the other night, which is so good, a really smart, well-made movie. I was so nervous and tense the whole time, but I also had a really emotional experience with it. The fact that it’s really scary is just icing ontop of the cake. 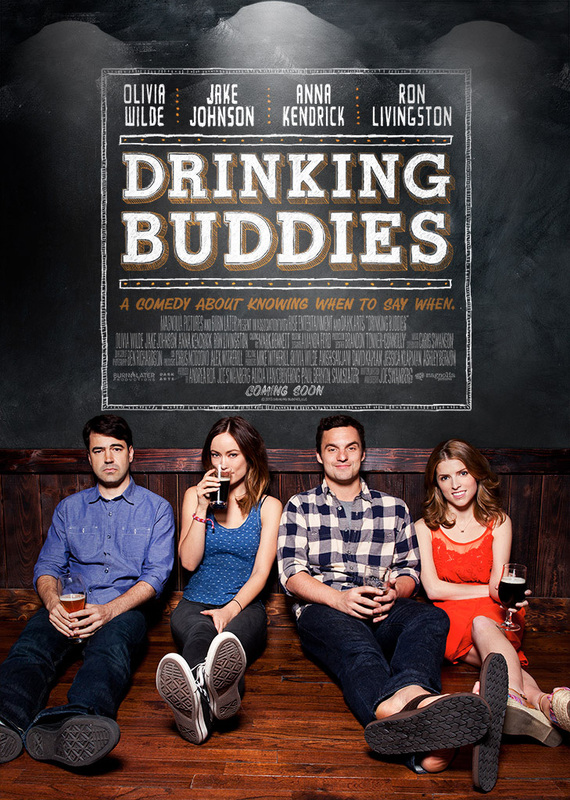 Drinking Buddies is now available VOD. It opens in Philly area theaters this Friday.